The BounceFort Plus 2 comes with ample room for up to 3 kids. For all the little thrill seekers, Lifespan Kids BounceFort Plus 2 comes with a 1.71m slide for some climb and slide action. Lifespan Kids BounceFort Plus 2 comes with an electric air pump to keep your castle inflated during play. They've also got a UV-resistant coating on the material for the harsh Aussie sun. For all little athletes out there - an awesome Basketball hoop with a ball pit/net ramp for heaps of ball play fun. 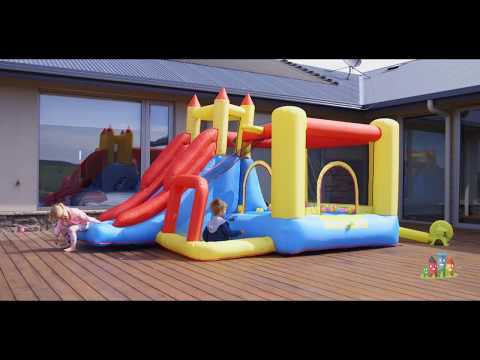 Lifespan Kids BounceFort Castle passes all relevant Australian Safety Standards. Add another dimension to your kids play. (Play balls not included). Lifespan Kids BounceFort Plus 2 comes with double stitching and heavy duty puncture proof materials for maximum durability. Kids love to use their imagination during play - the numbers are simple to follow and great to bounce with. Simply switch on your electric air pump and it inflates in a couple of minutes. The most hassle free assembly play-set ever! Meets EN71 European Safety Standards. * Simply turn on the Electric Air Pump (requires mains power), attach the air-way port to inflate the castle. * 12 Months parts replacement warranty. Already delivered. Very quick service.